Whew, we made it through Thanksgiving and now it’s on to December. If there’s one thing you need at this time of year it’s quick and easy meals that you can toss in a multi cooker and forget about it while you finish your mile long to-do list that December is famous for! 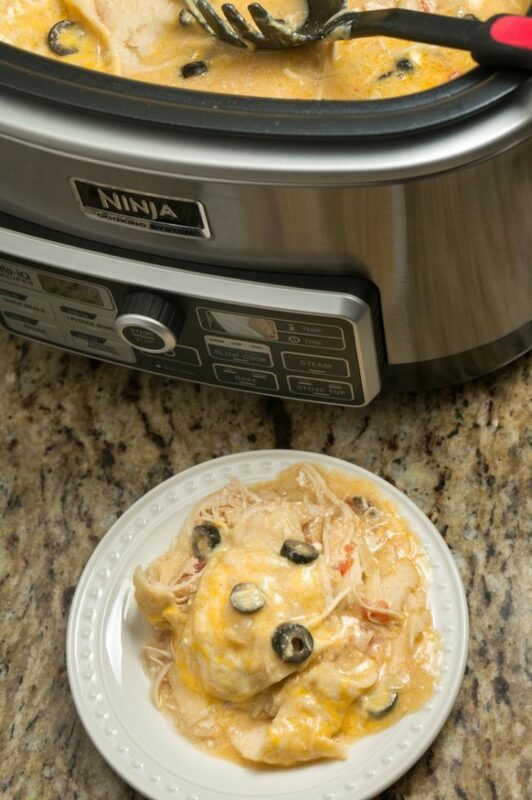 We’ve got an amazing slow cooker enchilada casserole recipe to share, but first I’ve got to gush about the Ninja® Cooking System with Auto-iQ™ that completely saved Thanksgiving this year! We moved into a new home at the very end of 2016. Our new home is beautiful and has everything we need, that is until we realized the one tiny built-into the cabinets oven just wasn’t going to work for Thanksgiving! We’ve always hosted, and my husband will never settle for cooking only a partial Thanksgiving meal, that means we needed a solution to cook both a turkey and a ham, but with no where near enough room in our tiny oven. We cooked the turkey first, priorities here! 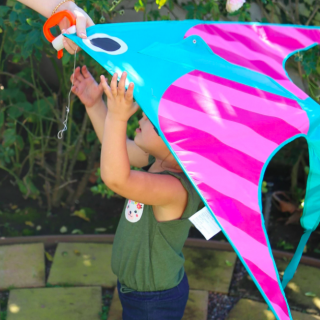 But our unstuffed bird was done way before we expected it to be. We carved up the turkey and then we were brainstorming what to do next. That’s when I pulled out the Ninja Cooking System with Auto-iQ I had received just the week before and hadn’t had a chance to check out yet. It had a large inner pot that holds 6 quarts. It was large enough to hold our entire carved 20 lb turkey! I didn’t trust a traditional slow cooker because they tend to change the texture of the food to a sometimes too soft texture. I also didn’t want the turkey to be dry. But right there on the front of the multi cooker was an option for Stay Warm! Perfect! We loaded up all the turkey and poured in some of the drippings as well to keep the moisture. It worked amazingly well. The turkey stayed warm even though it was in the multi cooker for another 3 hours until it was time for the feast and it tasted exactly the same (and just as hot) as the first few bites we all nibbled when the turkey was first carved. With the Ninja Cooking System with Auto-iQ you’ll get so much more than just the stay warm feature. In fact, it’s a whole lot more than just a slow cooker, too. You can bake in it, just like your oven, with temperature range from 250° to 425° giving you another spot to cook in, freeing up your oven for other foods! Use the steam function to cook your vegetables or proteins. Sear meats just like you would on the stove top in a skillet or saute your veggies. Or use the smart Auto-iQ settings to perfectly cook a recipe with no extra thought required. 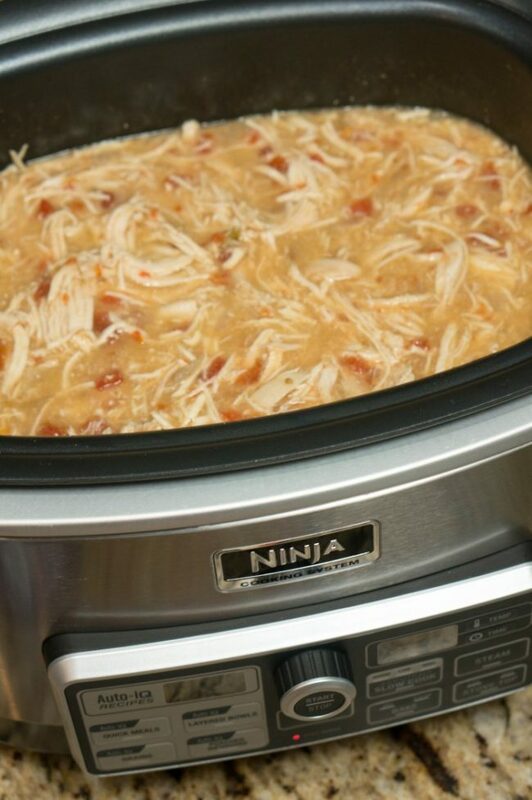 Included with the Ninja Cooking System with Auto-iQ is a slow cooker recipes booklet — Ninja® Delicious Done Easy cookbook — that will guide you with quick meals and even fun layered bowls to inspired your next weeknight meal. The Ninja cooking system with Auto-iQ has a completely unique design with the ability to heat the food from the bottom and all sides for an evenly cooked meal. This one appliance has become the workhorse around my kitchen because there’s just so much it can do. 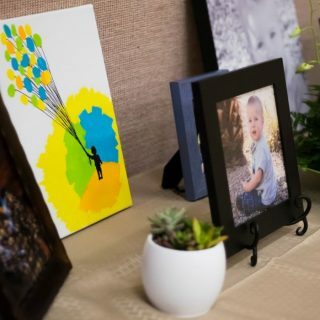 It’s become a staple that has a permanent spot in my kitchen. I love that I can bake in it and replace my outdated slow cooker! Don’t wait to order your Ninja Cooking System with Auto-iQ, it’s the next big thing to come to kitchens that will save the day over-and-over again making meal times so much easier! Use my exclusive promo code: MOMSTAKE15 to save 15% off your purchase (Expires 12/31/17). You can also try your luck at winning one of these amazing multi cookers! 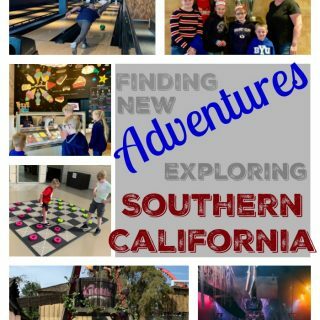 The giveaway is open for entry through December 31st, 2017. 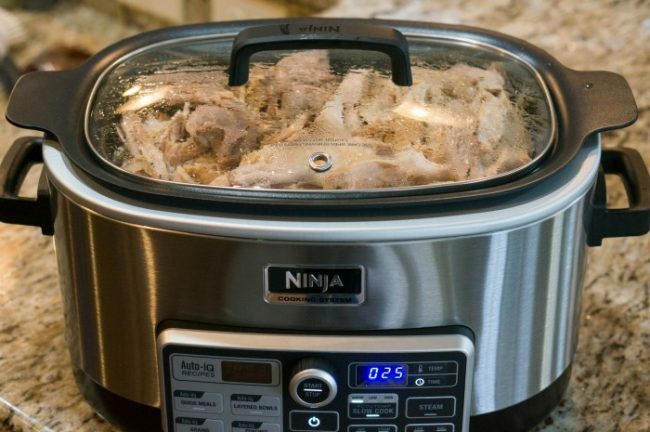 We made an oh-so-easy weeknight dinner recipe using our Ninja Cooking System with Auto-iQ. This recipe takes less than five minutes prep and then the multi cooker will do all the work for you! 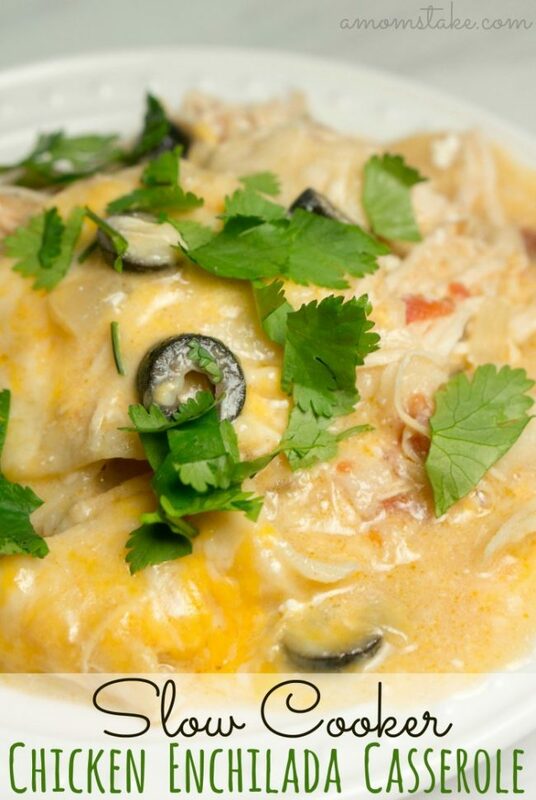 You start by cooking the chicken in a bed of enchilada sauce until it’s soft and tender. Then shred it up and warm a bed of tortillas, cheese, and olives toppings and it will be ready to serve in a half hour. You can add additional extra toppings if you’d like including black beans, salsa, cilantro, or an extra dollop of sour cream on top – but those are all optional. Pour half the enchilada sauce into a slow cooker. Place chicken breasts into the sauce, and diced onions, and can of green chilies and diced tomatoes. Top with remaining enchilada sauce. and cook on high for 3 hours. 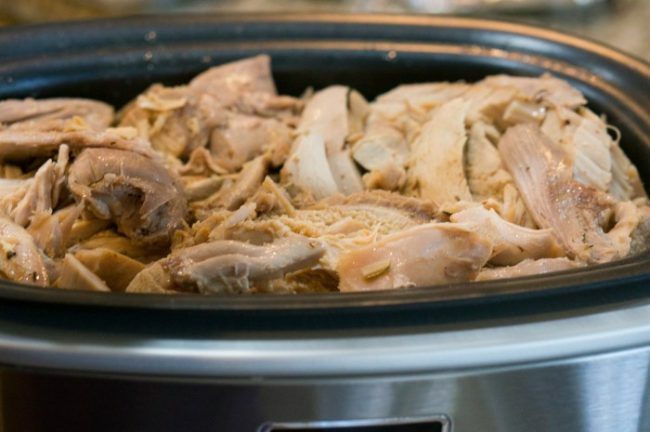 Shred the chicken in the crock pot using two forks or a stick blender. Add sour cream and mix. Create a casserole by layering cut corn tortillas on top of the chicken. Sprinkle with cheese and then top with olives. Cook on low for 30-45 minutes longer, or until cheese is melted. Don’t wait to take advantage of the coupon offer to get your own Ninja Cooking System with Auto-iQ with a limited time 15% off promotion! Scroll back up to get the coupon code and then make this easy slow cooker recipe in your new multi cooker! Has anyone made this yet? i love my slow cooker and enchiladas. i’ll have to try this oon as it looks amazing. I am officially craving enchiladas. Your recipe looks absolutely divine and I love that it’s made in the slow cooker! I am in love with that Ninja cooking system. Can’t wait to get one and make this casserole! 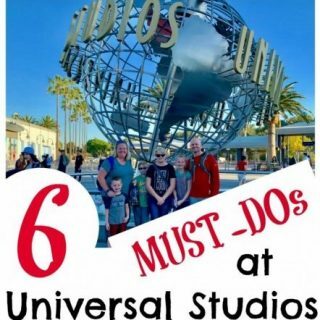 There are just so many things you can do with an Instant Pot! 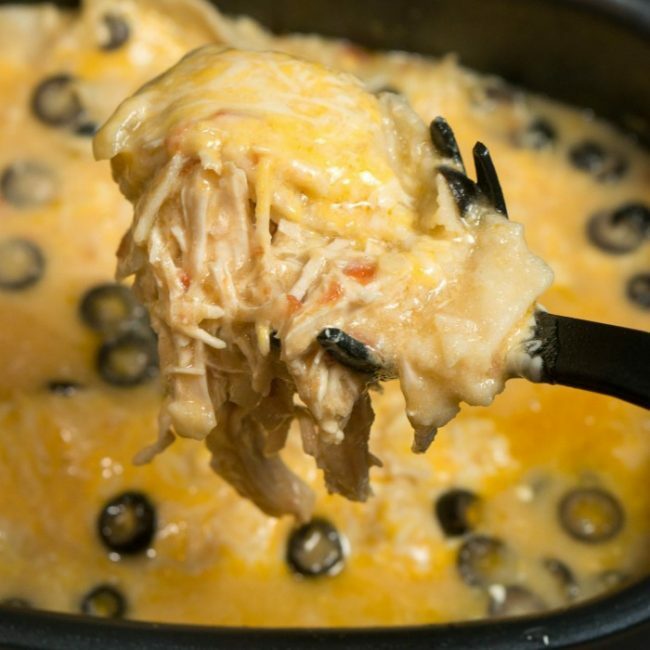 This chicken enchilada casserole sounds like it would be yummy! I love anything that I can cool in the slow cooker. It is definitely my favorite way to prepare meals. What a great appliance to have in the home. I love that it can do multiple types of cooking. I love enchiladas, and I love easy dinners. This looks so good to me. 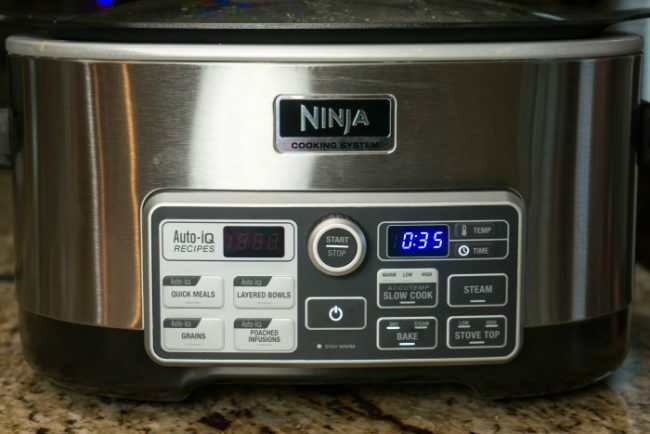 I would love to find a Ninja Cooking System with Auto-iQ under the tree for me this year. This recipe looks so delicious. I am sure it will be a big hit. This sounds really delicious. I love easy it is to put together. My whole family would love this recipe. That chicken must be so tender and delicious. I could totally go for a cheesy casserole like this. With how busy I have been lately this would be a perfect way to eat a dinner and not have to cook it at the end of the day! This looks so good! This recipe is perfect for my family. 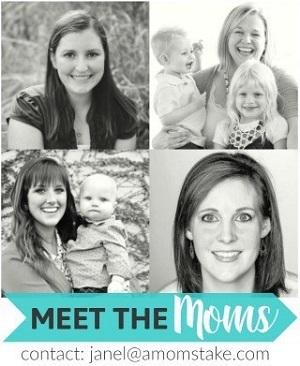 We love enchiladas and anything that is in the slow cooker makes me happy. I love this so much! It looks delicious and it’s DOUBLE easy! Let me explain. Casseroles? Easy. Slow cooker? Easy. That’s DOUBLE easy!